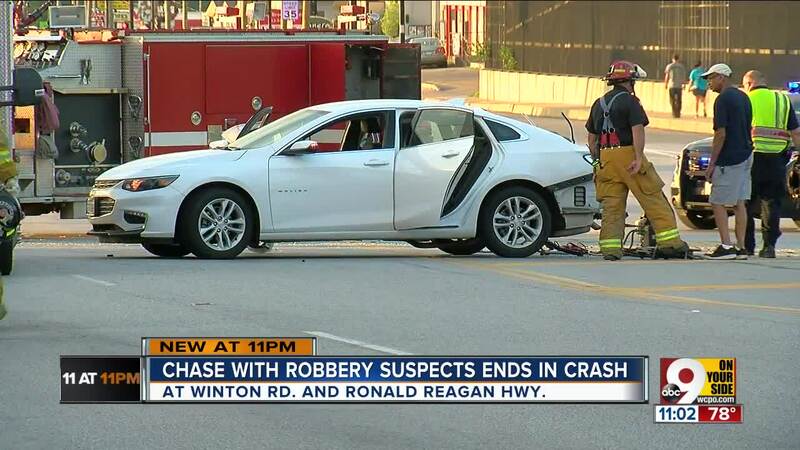 CINCINNATI – Police calls described tense moments as two suspects drove the wrong way on Ronald Reagan Highway at speeds up to 115 mph, then crashed into a car carrying three kids after they got off on Winton Road Saturday evening. LISTEN to the calls below. The kids were OK after being treated at the scene, police said. The suspects were identified Sunday as Ahkeela McCray, 26, of Avondale, and MIyoshi Flowers, 25, of West Price Hill. "I've got a vehicle fleeing." "Jesus, oh my God! Going the wrong way." "SB on Winton, crashed right on exit." "I GOT A GUN ON YOU. STOP!!" "Two at gunpoint. I got em." "I got three juveniles in the car." "We got black smoke coming from the vehicle." "We're going to need multiple squads. I've got three juveniles with head injuries." "Female complaining of being ran over by the vehicle. She was in the vehicle." "There are flames coming from the vehicle." "Three juveniles 9, 7, and 6 all complaining of head injuries." The incident started about 7:30 p.m. with a robbery call at Marshalls at Northgate Mall, police said. Officers said they saw two women get into a black Camry and determined that the car had been stolen. They pursued the Camry southbound on Colerain Avenue to Ronald Reagan at up to 70 mph. The Camry then headed west on Ronald Reagan, driving the wrong way, crossing the median and weaving in and out of traffic, according to police. The adult driving the kids in a white car was not seriously hurt, police said. The suspects’ car went off the road into a clump of trees. The two women were transported to University of Cincinnati Medical Center with head injuries not considered life threatening, police said. Flowers was transferred to the Justice Center on Sunday. Colerain police spokesperson Jim Love said it could have been a lot worse. "Totally ignoring the safety of people all down the highway, not only this exit," Love said at the crash scene. "We're thankful, grateful that it didn't turn out worse. As you know, all it could take is a head-on, all it could take is something different, this story could be a whole lot different tonight." McCray is accused of taking clothes worth $371 from Marshalls, according to court documents. She has been charged with theft, possessing criminal tools (a magnetic sensor remover) and obstructing official business (for fleeing after the crash). Flowers has been charged with receiving stolen property, failure to comply and driving under suspension.